1. WILLIAM1 FULLER was born Bet. 1423 - 1430 in Redenhall, Norfolk, England. He married MRS. WILLIAM (FULLER). She was born Abt. 1427 in Redenhall, Norfolk, England. The Fullers were from Redenhall Parish, Norfolk County, England, as shown by the red star on the map right. 2. i. JOHN2 FULLER, b. 1460, Redenhall, Norfolk, England; d. May 17, 1511, Redenhall, Norfolk, England. 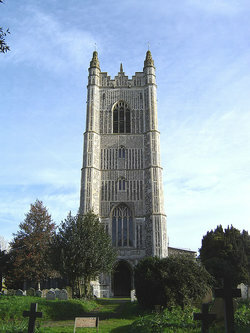 Below left is a picture of St. Marys Church in Redenhall, Norfolk County, England. Here can be found records of the Fuller family. 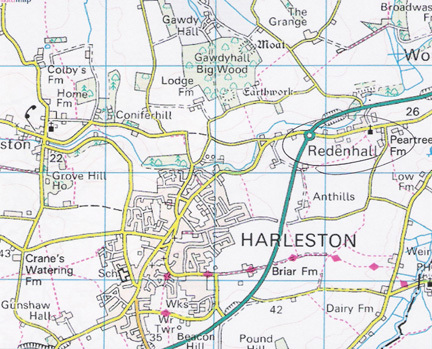 Below right, Redenhall is now a suburb of Harleston. A symbol for St. Marys can be seen center right in picture. 2. JOHN2 FULLER (WILLIAM1) was born 1460 in Redenhall, Norfolk, England, and died May 17, 1511 in Redenhall, Norfolk, England. He married ALICE. She was born Abt. 1452 in England. "St. Mary's [church parish] Redenhall is an elongated Parish bounding the River Waveney in the South and extending some 3 miles to the North, to include Clintergates and other scattered farms. The orginal settlement was probably by the river, where Anglo-Saxon and Danish invaders would have made their entry-hence the name Redenhall, the place in the reeds. ...the Church was built upon a commanding knoll. Excavations in 1858 revealed evidence of an older building on the same site with a round tower, a characteristic feature of Waveney Valley churches of the Saxon and Norman periods. The present building was begun about 1460 and finished in about 1520. "There are living in Redenhall, Norfolk, England in 1482 and 1488, John and William Fuller, both freeholders, as they were serving on a jury in 1508. Wiliam Fuller and John Fuller Jr. were named as grantees in a deed of land in Redenhall. This land was bounded on one side by the free land of John Fuller. A copy of this deed may be seen in the Edgerton Mns. 2713. vol. 7, British Museum. These Fullers... lived at Redenhall and owned estates there prior to 1482... John and William are the first ancestors of our Fuller family of whom at present we have a definite record of." 3. i. WILLIAM3 FULLER, b. 1483, Redenhall, Norfolk, England; d. Abt. 1522, Redenhall, Norfolk, England. 3. WILLIAM3 FULLER (JOHN2, WILLIAM1) was born 1483 in Redenhall, Norfolk, England, and died Abt. 1522 in Redenhall, Norfolk, England. He married MRS. WILLIAM (FULLER). She was born Abt. 1487 in Redenhall, Norfolk, England. 4. i. JOHN4 FULLER, b. 1518, Redenhall, Norfolk, England; d. May 03, 1559, Redenhall, Norfolk, England. 4. JOHN4 FULLER (WILLIAM3, JOHN2, WILLIAM1) was born abt. 1515-1518 in Redenhall, Norfolk, England, and died May 03, 1559 in Redenhall, Norfolk, England. He married ANN COLLINGE Abt. 1547 in Redenhall, Norfolk, England. She was born Abt. 1514 in Redenhall, Norfolk, England, and died in Redenhall, Norfolk, England. 'He [John] left a well dated 4 Feb 1558-9, proved 12 May 1559, 'Gives to son John Fuller all lands and tenements both bound and free, in Redenhall, Wortwell, as elleswyer,' he paying to my son Robert Fuller 10p. To Ales my daughter 6p, 8s, 4d... Son John executor; witness, Thomas Fuller, Thomas Warde, John Barne, William Norton." 5. i. ROBERT5 FULLER, b. Abt. 1548, Redenhall, Norfolk, England; d. May 1614, Redenhall, Norfolk, England. 5. ROBERT5 FULLER (JOHN4, WILLIAM3, JOHN2, WILLIAM1) was born Abt. 1548 in Redenhall, Norfolk, England, and died May 1614 in Redenhall, Norfolk, England. He married SARAH DUNKHORNE January 29, 1572 in Starston, Norfolk, England. She was born Abt. 1552 in Starston, Norfolk, England, and died July 1584 in Redenhall, Norfolk, England. "The will of Robert Fuller of parish of Redenhall, yeoman, dated 19 May 1613, proved 31 May 1614 by the widow, and 16 June 1614 by Thomas Fuller, names wife Frances; sons Edward, Samuel and Thomas; daughter Ann Fuller, Elizabeth Fuller, and Mary Fuller; grandson John Fuller, son of his son John Fuller." 6. i. EDWARD6 FULLER, b. September 04, 1575, Redenhall, Norfolk, England; d. Aft. January 11, 1621, Plymouth, Plymouth, MA. ii. SAMUEL FULLER, b. Abt. 1580. 6. EDWARD6 FULLER (ROBERT5, JOHN4, WILLIAM3, JOHN2, WILLIAM1) was born September 04, 1575 in Redenhall, Norfolk, England, and died Aft. January 11, 1621 in Plymouth, Plymouth, MA. He married MRS. EDWARD (FULLER) 1602 in Redenhall, Norfolk, England. She was born Abt. 1581 in Redenhall, Norfolk, England, and died Aft. January 11, 1621 in Plymouth, Plymouth, MA. "Samuel and Edward Fuller who came on the 'Mayflower' were sons of Robert of Redenhall, England." 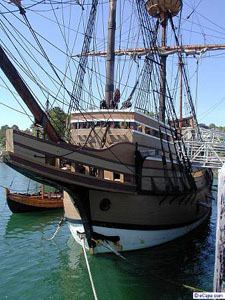 "Edward Fuller, his wife, and son Samuel came to Plymouth on the 'Mayflower' in 1620. Edward was one of those who signed the 'Mayflower Compact' on 11 November 1620. "Edward Fuller was baptized at the parish of Redenhall, County of Norfolk, England on 4 September 1575, son of Robert Fuller. While some accounts make him the son of Frances, who is named in Robert's will, a convincing case has been made that Frances was the second wife of Robert Fuller, and that Robert Fuller married first, at Starston Parish, Co. Norfolk, England, 29 January 1572/3 Sara Dunkhorn and that she is the mother of Edward and Samuel Fuller of the 'Mayflower.' Sarah Fuller wife of Robert Fuller, was buried at Redenhall 1 July 1584. "It has recently been discovered that Edward and his unnamed wife were among the English Separatists living in Leiden, Holland. Edward is mentioned in Leiden Judicial Archives 79, L, Folio 172 verso. "Savage calls his wife Ann, but there is no known evidence that this was her name." "In ye name of God, Amen. We whose names are underwritten, the loyall subjects of our dread soveraigne Lord, King James, by the grace of good, of Great Britaine, Franc, and Ireland king, defender of the faith, etc. "Haveing undertaken, for ye glorie of God, and advancemente of ye Christian faith, and honour of our king and countrie, a voyage to plant ye first colonie in ye Northerne parts of Virgina, doe by these presents solemnle and mutualy in ye presence of God, and one of another, covenant & combine our selves togeather into a civill body politick, for our better ordering & preservation & furtherance of ye ends of afresaid; and by vertue hearof to enacte lawes, ordinances, act constitutions, & offices from time to time, as shall be thought most meet & convenient for ye generall good of ye Colonie, unto which we promise all ldue submission and obedience. In witnes wherof we have hereunder subscribed our names at Cap-Codd ye 11th of November, in ye year of ye raigne of our soveraigne lord, King James, of England, France & Ireland ye eighteenth, and of Scotland, ye fiftie fourth. Signers of document: "John Carver, William Bradford, Edward Winslow, William Brewster, Isaac Allerton, Miles Standish, John Alden, Edward Tilly, John Tilly, Francis Cook, Thomas Rogers, Thomas Tinker, John Rigdale, EDWARD FULLER, Digery Priest, Thomas Williams, Gilbert Winslow, Edmund Margeson, Peter Brown, Richard Bitteridge, George Soule, Samuel Fuller, Christopher Martin, James Chilton, John Craxton, John Billington, Moses Fletcher, John Goodman, John Turner, Francis Eaton, John Allerton, Thomas English, Edward Dotey, Edward Leister, Richard Clark, William Mullins, William White, Richard Warren, John Howland, Stephen Hopkins"
"There are now (1954) four memorials to the Pilgrims on Cole's Hill...The sarcophagus [above], within which have been deposited the bones of the Pilgrims which have been found at various times in or near its location, erected by the General Society of Mayflower Descendants in 1920. 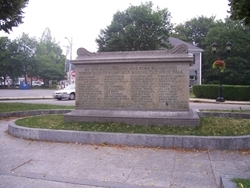 A part of the inscription reads: 'The Monument marks the first Burying Ground in Plymouth of the passengers of the Mayflower. Here under cover of darkness the fast dwindling company laid their dead, leveling the earth above them lest the Indians should know how many were the graves." 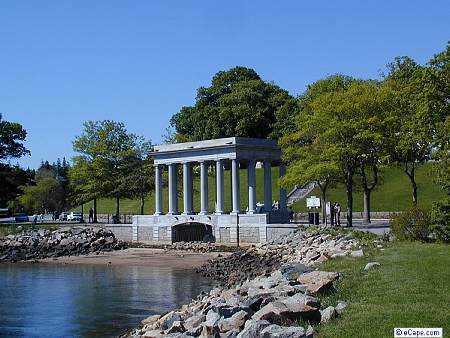 At right is the memorial spanning the sight of Plymouth Rock. 8. i. CAPT. MATTHEW7 FULLER, b. Abt. 1603, prob. Redenhall Parish, Harleston, Norfolk, England; d. Bet. July 25 - August 22, 1678, Barnstable, Barnstable, MA. 9. ii. SAMUEL FULLER, b. Abt. 1608, prob. England; d. October 31, 1683, Barnstable, MA. 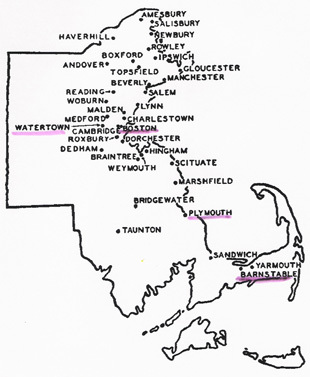 A map of Cape Cod, Massachusetts, at left, shows the primary locations of the towns in which members of the Fuller family lived and died. Barnstable is marked by the red star, and this is where Capt. Matthew Fuller took up residence as military officer, physician, and farmer. Plymouth, where his father Edward died that first winter of 1621, "the starving time" as Governor Bradford called it, is north of Barnstable. Scituate, which also figured prominently in the history of the pilgrims and Fuller family, is north of Plymouth. At right is a map of settlements in colonial Massachusetts. 8. CAPT. MATTHEW7 FULLER (EDWARD6, ROBERT5, JOHN4, WILLIAM3, JOHN2, WILLIAM1) was born Abt. 1603 in prob. Redenhall Parish, Harleston, Norfolk, England, and died Bet. July 25 - August 22, 1678 in Barnstable, Barnstable, MA. He married FRANCES April 08, 1635 in Scituate, Plymouth, MA. She was born in England, and died in Barnstable, Barnstable, MA. 'There has long been a question as to whether Matthew Fuller was actually a son of Edward. For a full detailed discussion of Matthew Fuller's parentage, see the article 'Was Matthew Fuller of Plymouth Colony a Son of Pilgrim Edward Fuller?' which confirms the relationship. 'He [Matthew] m. presumably in England, Frances ___ who was living 30 Oct. 1678 when she swore to his inventory. As Frances was Matthew's sole executrix, it is likely that she was the mother of at least some of Matthew's children. 'Matthew Fuller arrived in Plymouth bef. 26 Oct. 1640 when he sold land lately purchased of John Gregory. He probably brought his wife Frances and children born in England with him. In 1642 he was propounded a freeman, served as a juryman, and was assigned ten acres of land near Thurston Clark. In 1643 he was chosen sergeant in the newly established 'military discipline.' He was called of Plymouth in a deed of gift of two acres on 16 March 1648/9 from Samuel Fuller. 'Exactly when he moved to Barnstable is unknown, but on 5 Oct. 1652 the Court approved his election as lieutenant of the Barnstable militia. He was admitted a freeman on 7 June 1653, and in that year served as deputy from Barnstable to the Plymouth Court. On 20 June 1654 he was appointed Lieutenant, under Capt. Myles Standish, of a 50-man quota to fight against the Dutch at Monhattoes (New York), but receipt of news of peace between England and Holland on 23 June 1654 made the expedition unnecessary. On 2 Oct. 1658 he was elected a member of the Council of War, and in 1671 became its chairman. On 17 Dec. 1673 he was appointed Surgeon General of the Colony troops; he also served as captain of the Plymouth Colony forces during King Philip's War. 'He was one of the first physicians to settle at Barnstable. He took a public stand on the side of the unpopular Quakers and received a fine for it. He lived in the northwest corner of Barnstable at Scroton Neck, but also owned land in Falmouth and Middleboro which had been granted to him by the Colony for distinguished service. He died a wealthy man for the times. "Matthew Fuller was born in England, son of Edward Fuller. 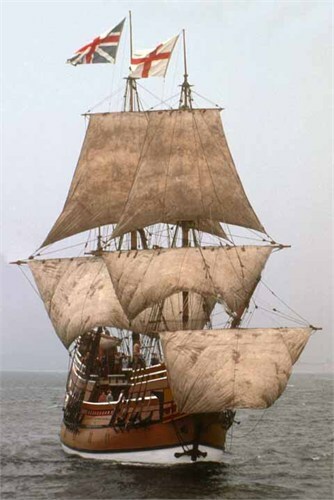 He did not embark in the 'Mayflower' with his parents, but came with a later group of emigrants as head of a family. It is thought that while in England, he had married Francis ____, credited with being the mother of some, if not all, of his children, two sons and three daughters, some of whom were born before leaving England. Matthew brought his family to Plymouth by 1640. Plymouth colony records in September of that year and describes his garden place in Plymouth and the six acres of land which he had recently purchased from John Gregory. In 1642, he had land assigned to him, was a juryman, and was propounded as freeman. The next year he was appointed sergeant of the military company raised in Plymouth, Duxbury, and Marshfield, of which Myles Standish was captain. In about 1650, he removed to Barnstable where he followed the profession of physician. He took a public stand on the side of the unpopular Quakers there and received a fine for it. In 1673, he became Surgeon General of the Plymouth colony forces, and he was a captain in 1676 in King Philip's War. Matthew Fuller of Barnstable prepared a will dated 25 July 1678 which was sworn 30 October 1678. He wife Frances was executrix." "The five and twentieth day of July in the yeere of our Lord one thousand six hundred seaventy and eight, I Matthew Fuller of the Towne of Barnstable in the Collonie of New Plymouth, Being sicke of body, but of Good and perfect memory, thanks be unto almighty God; and Calling to Remembrance the uncertaine state of this transitory life and that all Flesh must yield unto Death, when it shall please God to Call, doe make Constitute and ordaine and declare this my last will and Testament, In manor and forme following. Revoking and Anulling by these presence all and every testament and Testaments will and wills heertofore by mee made and declared either by word or writing; and this to be taken onely for my last will and Testament; and none other; and first being penitent and sorry from the bottom of my heart for my sins past, most humbly desiring forgiveness for the same. "I Give and Comitt my soyle upto almighty God my Savior and Redeemer, in whom and by the Meretts of Jesus Christ I trust and believe assuredly to be saved, and my body to be buried in such place as my executors heerafter named shall appoint, and Now for the Settling of my temporall estate and such Goods Chattels and debts as it hath pleased God farr above my desires (?deserts) to bestowe on mee. I doe order Give and dispose the same in manor and forme following. That is to say first I will that all those debts and dutyes as I ow in Right or Conscience to any manner of person or persons whatsoever shal be well and truly contented or ordained to be payed within Convenient time after my decease by my executors heerafter Named. "Item. I Give and bequeath unto Shubael Jones my grandchild the Reputed son of Ralph Jones the angle lott of marsh meddow which I formerly bought of his father Ralph Jones after Frances my wifes decease. "I give and bequeath the one halfe of all my Lands and meddow I have in the Townshipp of Barnstable or elsewhere in America. To my welbeloved son John Fuller after Frances my wifes decease. "I give and bequeath unto the naturall sonnes of my son Samuel Fuller deceased, Thomas Fuller, Jabez Fuller, Matthias Fuller and Samuel Fuller The other halfe of all the lands and meddows I have in the Townshipp of Barnstable or elsewhere in America after my wifes decease. "I give and bequeath to Samuell Fuller the son of Samuell Fuller my eldest son deceased my now dwelling house with all the land and meddow belonging to the homestead where I now live, after my wifes decease and if it hapen that hee shoyld die without Issue That then it shall Goe to the Rest of them brethren that do survive. "It is my will that if my son John Fuller die without Issue that then the lands and meddowes I have already Given to him Bethyah the wife John Fuller shall enjoy the full benifitt and use of themm to her dieing day, and then Goe to the Rest of my children begotten of my owne body. "I give and bequeath to my daughter Mary Jones the wife of Ralph Jones Ten pounds in mony. "Item. I give and bequeath unto my Daughter Ann Fuller The now wife of Samuell Fuller ten pounds in mony. "Item. I give and bequeath unto my Daughter Elizabeth Rowley the wife of Moses Rowley ten pounds in mony. "Item. I give and bequeath unto Sarah Rowley the daughter of Moses Rowley all my sheep and by these presents I doe appoint Jedediah Jones to oversee the sheep That they be Imployed wholly for the use of the said Sarah. "Item. I give and bequeath ten poynds to Jedediah Jones, the son of Ralph Jones in Mony. "Item. I give and bequeath to every one of my male Grandchildren half a Crowne a peece in old England mony. "Item. I give to every one of my severall Grandchildren twelve pence a peece in old England mony. "Item. I give to Ralph Jones, Samuell Fuller Junr and Moses Rowley Senr my sonnes-in-law, five shillings a peece in mony. "I Give and bequeath unto my onely beloved son John Fuller twenty ponds in silver mony and to his wife Bethya twenty shillings in Gould. "I Give to Mary Fuller the late wife of my son Samuell Fuller deceased five shillings in Mony. "I give and bequeath unto Robert Marshall the Scotsman a peece of Cloth intended to make mee a suite off. "Item. I Give and bequeath to Jasper Tayler two Raysers. "I Give and bequeath to Francis my deare and welbeloved wife who by these presents I doe ordaine and declare to be the sole executrix of this my last Will and Testament the use and Improvement of all my housing lands and meddows during her Narurall life, as alsoe aall my Moveables, household stuffe Cattle horse kind swine whatsoever else Can be Named and disposed of to be att her dispose forever. "In witness whereof I have heer unto sett my hand and seal the day and year above said. Matthew Fuller and a seal. Lieut. Joseph Laythorpe and John hawes made oath to the truth of the Will above written viz. That they did see Capt Mathew Fuller above said signe and seale and declare this aforesaid Will to be his Last Will and Testament before the Court holden att Plymouth the 30th of October 1678. " 10. i. LIEUT. SAMUEL8 FULLER, b. Abt. 1630, prob. England; d. March 26, 1676, killed at Rehoboth, Bristol, MA. ii. MARY FULLER, b. Aft. 1630.
iii. ELIZABETH FULLER, b. Aft. 1630. 11. iv. JOHN FULLER, b. Aft. 1640, Plymouth, MA; d. Bef. July 16, 1691, Barnstable, MA. 12. v. ANNE FULLER, b. Abt. 1640; d. Bef. December 30, 1691, Barnstable, MA. 9. SAMUEL7 FULLER (EDWARD6, ROBERT5, JOHN4, WILLIAM3, JOHN2, WILLIAM1) was born Abt. 1608 in prob. England, and died October 31, 1683 in Barnstable, MA. He married JANE LOTHROP April 08, 1635 in Scituate, Plymouth, MA, daughter of REV. LOTHROP and HANNAH HOWES. She was born 1614 in Egerton, Kent, England. "this 16th of may 1650 Jane ffuler the wife of Samuel ffuler did com befor me Timothy hatherly asistant to the governer of new plimoth in new England and did freely acknowlidge her willingnes of the within mensioned sale and did freely resign up her right to peter Collemer--Timothy hatherly"
'After being left an orphan shortly after arriving in Plymouth on the 'Mayflower,' Samuel was brought up by his uncle, Dr. Samuel Fuller, the physician of the Pilgrims. Samuel was admitted a freeman in Plymouth Colony in 1634, moved to Scituate in 1635 where he built a house; he joined the Scituate church on 7 Nov. 1636; and was elected constable there in 1641. Sometime later he moved to Barnstable, to which his father-in-law had moved in 1638. Samuel was the only "Mayflower" passenger to settle permanently in Barnstable and was one of the last surviving "Mayflower" passengers. i. HANNAH8 FULLER, b. Abt. 1636. 13. ii. SAMUEL FULLER, b. Bet. February 11, 1637 - 1638; d. Bef. December 28, 1691, Barnstable, MA. iii. ELIZABETH FULLER, b. lliving October 29, 1683; m. ...TAYLER. iv. SARAH FULLER, b. August 01, 1641; d. Died young;. v. MARY FULLER, b. June 16, 1644.
vi. THOMAS FULLER, b. Abt. May 18, 1651; d. Died before father;. vii. SARAH FULLER, b. December 1654; d. living October 29, 1683;; m. ...CROWE/CROWELL. viii. JOHN FULLER, b. Abt. 1655.
ix. 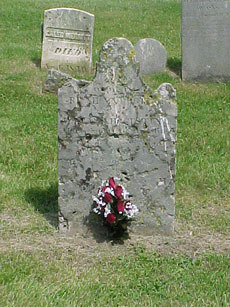 CHILD FULLER, b. February 08, 1658; d. Buried 15 days later;. 10. LIEUT. SAMUEL8 FULLER (CAPT. MATTHEW7, EDWARD6, ROBERT5, JOHN4, WILLIAM3, JOHN2, WILLIAM1) was born Abt. 1630 in prob. England, and died March 26, 1676 in killed at Rehoboth, Bristol, MA. He married MARY. 'Samuel lived in Barnstable. He was a lieutenant when killed at Rehoboth during King Philip's War. 'The will of 'Lieft. Samuell Fuller the son of Captaine Matthew Fuller deceased,' dated 2 Aug. 1675, sworn 7 June 1676 and 3 July 1676, names wife Mary, eldest son Thomas (not yet 21), other sons Jabez, Timothy, and Matthias, daughters Abigail and Anne; friends Elder John Chipman and Thomas Huckens with wife Mary to be joint execut ors. The inventory was attested 3 Jne 1676 by Mary relect of Lt. Fuller and mentions 'more due for his service to the country.' On 8 June 1676 Mary the wife of Lt. Samuel Fuller late deceased claimed to be with child, and the Court ordered that the child should have an equal portion of the estate with the younger children, and that if the child were to live, Mary was to have a "competency allowed her for and toward bringing up of the said Child out of the Intire estate of the said Lieftenant Fuller. 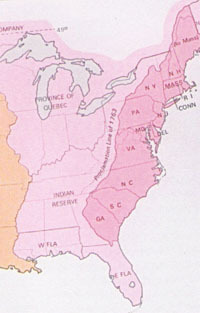 Rehoboth, as shown by the red star at far left, is west of Plymouth and Barnstable. This is where Lieut. Samuel Fuller was killed during King Philip's War, 1676. "Samuel Fuller was born about 1630, probably in England, and is thought to be the oldest of Matthew Fuller's children. He married Mary___, probably at Plymouth Colony. Samuel was killed at Rehoboth [ME, now MA] in King Philip's War, in the summer of 1676." 14. i. SAMUEL9 FULLER, b. Abt. 1676, Barnstable, MA; d. September 29, 1716, Mansfield, Tolland Co., CT.
ii. THOMAS FULLER, b. Abt. 1661. 15. iii. JABEZ FULLER, b. Abt. 1663; d. Bef. September 15, 1711, Middleboro, MA. iv. ANNE FULLER, b. Abt. 1669.
v. MATTHIAS FULLER, b. Abt. 1672; d. Bef. May 06, 1697. "The will of Matthias Fuller of Barnstable 'being Designed for and upon the Counterys of Cervice against the French and Indian Enemies,' dated Boston 7 Aug. 1696, probated 28 May 1697, mentions brother Timothy Fuller of Haddam, grandfather Matthew Fuller late of Barnstable dec., honored mother (not named), and 'Rest of my Brothers and Sisters.' Inv. taken 6 May 1697." 16. vi. ABIGAIL FULLER, b. Abt. 1674, Barnstable, MA; d. April 11, 1718, Newton, MA. 11. JOHN8 FULLER (CAPT. MATTHEW7, EDWARD6, ROBERT5, JOHN4, WILLIAM3, JOHN2, WILLIAM1) was born Aft. 1640 in Plymouth, MA, and died Bef. July 16, 1691 in Barnstable, MA. He married HANNAH MORTON Bet. March 24, 1685 - 1686. She was born November 27, 1666 in Plymouth, MA, and died October 07, 1738 in Plymouth, MA. i. BETHIA9 FULLER, b. 1687.
ii. JOHN FULLER, b. 1689.
iii. RELIANCE FULLER, b. 1691. 12. ANNE8 FULLER (CAPT. MATTHEW7, EDWARD6, ROBERT5, JOHN4, WILLIAM3, JOHN2, WILLIAM1) was born Abt. 1640, and died Bef. December 30, 1691 in Barnstable, MA. She married SAMUEL FULLER Bet. 1657 - 1658 in Barnstable, Barnstable, MA, son of SAMUEL FULLER and JANE LOTHROP. He was born Bet. February 11, 1637 - 1638, and died Bef. December 28, 1691 in Barnstable, MA. i. BARNABAS9 FULLER, b. Abt. 1659.
ii. JOSEPH FULLER, b. Abt. 1661.
iii. MATTHEW FULLER, b. Abt. 1663.
iv. BENJAMIN FULLER, b. Abt. 1665.
v. DESIRE FULLER, b. Aft. December 30, 1670.
vi. SARAH FULLER, b. Aft. December 30, 1670. 13. SAMUEL8 FULLER (SAMUEL7, EDWARD6, ROBERT5, JOHN4, WILLIAM3, JOHN2, WILLIAM1) was born Bet. February 11, 1637 - 1638, and died Bef. December 28, 1691 in Barnstable, MA. He married ANNE FULLER Bet. 1657 - 1658 in Barnstable, Barnstable, MA, daughter of CAPT. FULLER and FRANCES. She was born Abt. 1640, and died Bef. December 30, 1691 in Barnstable, MA. Children are listed above under (12) Anne Fuller. 14. SAMUEL9 FULLER (LIEUT. SAMUEL8, CAPT. MATTHEW7, EDWARD6, ROBERT5, JOHN4, WILLIAM3, JOHN2, WILLIAM1) was born Abt. 1676 in Barnstable, MA, and died September 29, 1716 in Mansfield, Tolland Co., CT. He married ELIZABETH THATCHER/THACHER October 03, 1700 in Mansfield, CT, daughter of RODOLPHUS THATCHER/THACHER and RUTH PARTRIDGE. She was born March 01, 1672 in Duxbury, MA and died Bef. 1730 in Barnstable, Barnstable, MA. 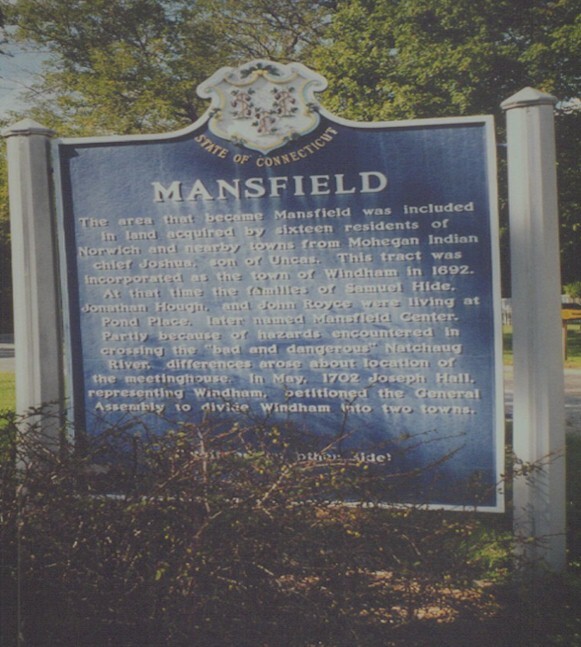 Also, according to the above volume, the children of Elizabeth and Samuel were born at Mansfield or Preston, CT, but the births were all recorded at Mansfield. "Samuel Fuller was born in Barnstable 15 August, 1676, within weeks of his father's death. He married Elizabeth Thatcher in Mansfield, Connecticut, 3 October 1700. She was the daughter of Rodolphus and Ruth Partridge Thatcher of Duxbury, Chilmark, and Lebanon, Connecticut. 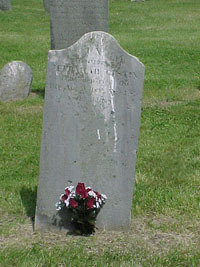 Samuel was a sergeant; he resided with his family at both Preston and Mansfield, in Connecticut. He will in Mansfield was dated 23 September 1716; an inventory was taken in 24 October 1716, leaving all his estate to his wife Elizabeth who was the executrix. They were parents of 3 sons and 4 daughters." "Elizabeth m. (2) Lebanon, CT 8 July 1724 Miles Standish, d. bef. 1730; a descendant of Pilgrim Myles Standish. Miles m. (1) Bristol (now RI) 5 Dec. 1700 'then removed to Preston, CT' Mehitable (Cary) Adams, widow of Elisha Adams. Miles had no children by either wife. 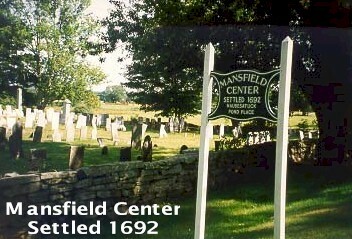 "In Dec. 1724 Elizabeth Standish of Preston, CT deeded to 'my son Rodolphus Fuller of Mansfield 216 acres in Mansfield...given me by the will of my former husband Samuel Fuller deceased." 17. i. ELKANAH10 FULLER, b. April 24, 1709, Mansfield, Tolland Co., CT; d. Aft. 1793, Freehold, Greene Co., NY. ii. REBECCA FULLER, b. July 22, 1701; m. JOSEPH ALLEN; b. January 13, 1701, Bridewater, MA. iii. RUDOLPHUS FULLER, b. August 22, 1703.
iv. RUTH FULLER, b. April 12, 1706.
v. WAISTILL FULLER, b. April 08, 1711.
vi. MARY FULLER, b. April 05, 1713.
vii. JUDAH FULLER, b. August 25, 1715. 15. JABEZ9 FULLER (LIEUT. SAMUEL8, CAPT. MATTHEW7, EDWARD6, ROBERT5, JOHN4, WILLIAM3, JOHN2, WILLIAM1) was born Abt. 1663, and died Bef. September 15, 1711 in Middleboro, MA. He married MARY HALLETT Abt. 1686. She was born Abt. 1667 in Barnstable, MA, and died Aft. May 11, 1721 in Middleboro, MA. i. LOIS10 FULLER, b. 1704. 16. ABIGAIL9 FULLER (LIEUT. SAMUEL8, CAPT. MATTHEW7, EDWARD6, ROBERT5, JOHN4, WILLIAM3, JOHN2, WILLIAM1) was born Abt. 1674 in Barnstable, MA, and died April 11, 1718 in Newton, MA. She married ISRAEL STOWELL. He was born August 10, 1670 in Hingham, MA, and died August 07, 1725 in Newton, MA. i. ABIGAIL10 STOWELL, b. 1699.
ii. DAVID STOWELL, b. Abt. 1701.
iii. ISRAEL STOWELL, b. Abt. 1703.
v. ELIZABETH STOWELL, b. Abt. 1705.
vi. ISAAC STOWELL, b. Abt. 1707.
vii. TEMPERANCE STOWELL, b. Abt. 1712. 17. ELKANAH10 FULLER (SAMUEL9, LIEUT. SAMUEL8, CAPT. MATTHEW7, EDWARD6, ROBERT5, JOHN4, WILLIAM3, JOHN2, WILLIAM1) was born April 24, 1709 in Mansfield, Tolland Co., CT, and died Aft. 1793 in Freehold, Greene Co., NY. He married NAOMI (FULLER). She was born 1713 in Sussex, NJ. "He m. (1) Mansfiled, CT 15 May 1731 Mary Andrews, b. E. Haddam, CT 2 Dec. 1710; d. Mansfield, CT 13 Sept. 1740; dau. of Samuel and Eleanor (Lee) Andrews. "He m. (2) Naomi---, d. bef. April 1767. "On 21 Sept. 1773 Elkanah Fuller bought land in Chatham, CT from his son-in-law Timothy Percival. "Elkanah was living in Chatham, CT in 1778 when he took an oath of fidelity. In 1793 he moved to Freehold, NY with his son-in-law Timothy Percival. "No CT PR for wives Mary and Naomi. No probate in Albany, Ulster or Greene cos. NY." "Elkanah Fuller was born 24 April 1709 at Mansfield, Connecticut. There also he married this first of three wives, Mary Andrews, 15 May 1731, mother of Sarah, Samuel, Eleanor, Mary, and Bethia. Second he married Naomi, mother of Samuel and Bethany. Third he married Lydia___Hooker of Mansfield, 6 April 1767, at which time he was said to be 'of Newton, Sussex County, New Jersey.' In 1778, He took an oath of fidelity while living in Chatham, Connecticut. Then in 1793 he removed to Freehold, New York with his son-in-law Timothy Percival." i. SAMUEL FULLER, b. Bet. February 09, 1743 - 1744.
ii. BETHANY11 FULLER, b. April 06, 1746, Mansfield, Tolland Co., CT; d. February 22, 1829, Red Lion, Warren Co., OH; m. JEREMIAH GUSTIN, February 03, 1763, Sussex, NJ; b. July 25, 1740, Glastonbury, Hartford Co., CT; d. August 31, 1823, Red Lion, Warren Co., OH. age 82 years 11 months & 10 days"
"In the name of God Amen I Jeremiah Gustin of Warren County in the State of Ohio being in perfect health of body & sound & disposing mind memory and understanding considering the certainty of death & the uncertainty of time being desirous to settle my worldly affairs & thereby be the better prepared to leave this world when it shall please God to call me hence do therefore make and publish this my last will Testament in manner & form following that is to say--I give & bequeath unto my beloved wife Bethany Gustin all my plantation I now live on as long as she shall live likewise her riding mare & two sows and all the household & kitchen furniture two beds & bedding. "I give & devise unto my son Benajah five acres of land of off the West end of my farm. I give & devise unto my son Samuel five acres of land of off my farm to be taken off the so as to lay East of the lot devised to Benajah. I give and devise unto my daughter Naomi Campbell & her son Jeremiah six acres of land to be taken off my farm out of the Northwest corner after Benajah & Samuels lots are taken off. I give & devise unto my son Jeremiah eight acres of land to be taken off of the South side of my farm & to include my mansion house. I give & devise unto my son JOHN five acres of land out of my farm to lie on the north of Jeremiah's lot. I give & devise unto my daughter Mary Stevenson four acres of land to be taken out of the Northeast corner of my farm to join my son John & my daughter Naomi Campbell & her son Jeremiah. I give & bequeath unto my son Elkana One Hundred Dollars forty of which he has already got. And lastly I hereby constitute 7 appoint my dear wife Bethany Gustin my son Samuel my son Jeremiah and my son in law John Stephenson to be my executors of this my last will Testament. In Testimony whereof I Jeremiah Gustin have hereunto set my hand & seal this 13th day of June A.D. 1822." 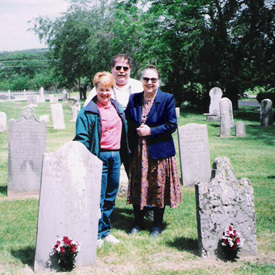 Pictured at right are three descendants of Bethany Fuller and husband Jeremiah Gustin: front left Melody Summers Hull, front right Katherine Dilts Summers, in back Thomas Andrew Hull (2003). 'The Gustins were the first persons to erect their log cabins in Clearcreek Township and for awhile formed a settlement among themselves with no neighbor nearer than two miles. Ohio was then an unbroken wilderness, the virgin soil was covered by trackless forests, where log cabins passed for houses, where all men worked with their hands, where all lived on pretty much the same social level where none were very rich and none very poor; such was the condition, and primeval environment, of the Gustin pioneers at Red Lion in the early years of the nineteenth century. 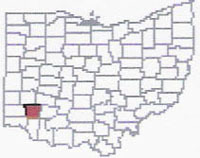 During the intervening period Warren County, Ohio (like Sussex Co., NJ of ye olden time), has been the birthplace or cradle, so to speak, of a numerous Gustin progeny. "...Jeremiah Gustin was a resident of New Jersey, but removed to Pennsylvania and lived several years; thence, in 1798, he, with his family moved into Ohio and located in Warren County, where he entered a section of land--sec. 9, Clear Creek Township-- and here opened out right in the woods, having to cut their way through the brush and timber for a road for their wagons to the spot where they cleared and erected a log cabin, with split puncheon floor, and began in true pioneer style; they had only one neighbor, Mr. Crane, nearer than two miles distant; here Mr. Gustin lived and labored till his death, Aug. 31, 1823, aged 93 years." "Jeremiah Gustin and family were natives of New Jersey and settled on a portion of land east of Red Lion in 1798. They had sliced their way through brush and timber, making a wagon road to the spot where they built their cabin. 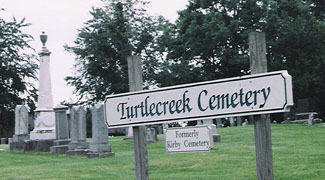 Abner Crane was their nearest neighbor, located about two miles away. "Jeremiah built a brick house in 1818 and lived there until his death in 1823. 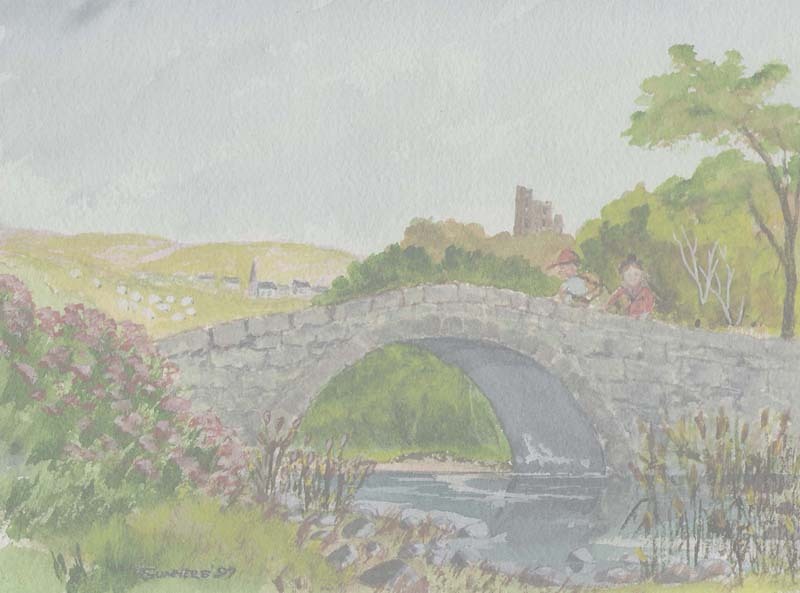 His son Elkanah married in Pennsylvania to Hannah Morris and traveled to Red Lion in 1800. They settled on a section of his father's land and reared 15 children, 8 sons and 7 daughters. "Samuel, son of Jeremiah Gustin, was born in New Jersey, but was raised mostly in Pennsylvania. The latter was his place of marriage, but in 1791 he migrated to Cincinnati. In 1798, he arranged for his father and other family members to be brought to Red Lion and located east of the locality. He fathered 13 children. Margaret, his second daughter, was said to have been the second white child born in Warren County. "Benajah Gustin was the son of Elkanah and Hannah Morris Gustin. He was born in Pennsylvania in 1797, and was about three years old when his family settled in the Red Lion area. As a youngster and in full life he suffered the hardships of pioneer existence. Benajah married Lydia Newport in 1820 and they were the parents of 11 children. "Red Lion, like many other small hamlets, never grew to any great size. About all the prosperous villages were fashioned around a body of water, but none flows within Red Lion's vicinity. "Crane [Abner] laid out the village of Westfield, now Red Lion, in 1817; it was laid out on the 'west field' portion of his land. "The first business in Westfield was a tavern that was constructed at the northeast corner of the five-point intersection, namely, the Red Lion Tavern, as per a sign of this effect. It faced west and was a long low log house with an attic in which people could sleep. In front was a wide uncovered porch of flagstones surrounded by a row of stones set on edge. A Mr. Holly managed the tavern until 1849. Benajah Gustin then operated the tavern for a few years to pay a debt of $10,000 that ht lost in the hog market. Mr. Gustin was a member of the early New Light Church and never used liquor or tobacco." "Jeremiah... with his parents to Greene Co., PA in 1798 in flat boat to Jarret's Station at mouth of Little Miami six miles above Cincinnati in Warren Co., Ohio. In 1790 he was living in Lower Smithfield Twp., Northampton Co., PA near son Benajah, David Dilts, and Martin Groff whose sons came with Benajah's sons to Madison County, Indiana. "Jeremiah entered section 9 Warren County, Ohio, a leafy wilderness 1798." quote from great-grandson James M. Gustin, Blanchester, Ohio: "My great-grandfather came here from Pennsylvania, came down on a flatboat, landed at Jarett's Station at the mouth of the Little Miami six miles above the now city of Cincinnati." Jeremiah settled four miles west of Lebanon in 1798 acquired an entire section of land which was later divided among his five sons and two daughters." aged 83 years & 25 days"
For a continuation of this Gustin-Fuller family, go to the Gustin page, generation #6. Fuller descendant Katherine Dilts Summers and husband John Phillip Summers have been to England nine times. In this watercolor "English Country Bridge" by JPS, they are pictured in the land of both of their ancestors.